You can adjust game settings in single or multi-player games in the Moderator Controls window. For multi-player games, only the person who created the game will have access to these game settings. These settings can be adjusted anytime during gameplay. You must apply settings during the planting phase so that changes will be seen in the current round. To apply new settings, simply check the options you want on or off and then click "Apply Changes" in at the top of the window. The settings will go into effect for the current round. The settings are described in detail below. 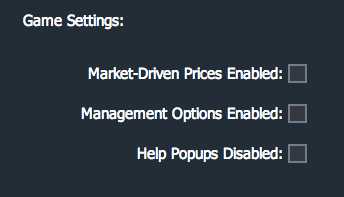 Market-Driven Prices Enabled: Select this option if you want crop prices to change in response to a supply-demand function. As an example, with this option enabled, if everyone in the game were to grow and sell corn and few were to grow switchgrass, then the price of corn would fall and the price of switchgrass would rise. Market-driven prices makes the game more complex and makes it more difficult to get the highest economic score. By default, crop prices do not change and are set as follows: alfalfa ($250/ton), switchgrass ($80/ton), and corn ($150/ton). Management Options Enabled: Select this option if you want add an additional stage during each round of gameplay in which players can adjust how much fertilizer is added to fields and decide whether to till the soil. This adds an additional level of complexity to the game. Read more about management options in the Crops and Management section. Help Popups Disabled: Select this option if you do not want to see informational pop-up windows that appear when you hover over crop planting icons or management icons. The pop-up graphics show the pros and cons of each crop and management technique. You may want to disable help pop-ups if you prefer to experiment with different strategies and evaluate graphs and feedback to discover how these crops compare based upon data and feedback observed during gameplay.